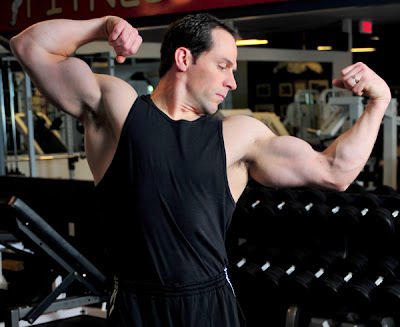 The best bicep exercise in my opinion is the preacher curl. However, you must have the right type of preacher bench in order to reap the benefits. The bench has to be well padded and the pad has to be rounded, not flat. Most preacher benches that are made are too steep and are flat. (45 degree pitch). This type of bench is poor because you cannot get enough support behind the humerus to get a deep contraction on the bicep. I have found that sometimes the more expensive a piece of equipment is does not necessarily mean that it is a superior product. I have developed many of my own pieces of equipment to develop the muscles more accurate. These pieces of equipment have saved me so much time. I find that some pieces of equipment are poor in isolating the muscle to get the response I want. When the exercise does work you will feel an immediate response. You can actually feel the blood rushing in to the muscle. Sometimes I need to get more torque on the muscle in order to get new growth patterns to develop. So I will tweak a particular piece of equipment to get the result I desire. It is great when the body responds to the stimulus. I have found that the preacher bench is the greatest piece of equipment for building biceps. The preacher bench I have at my gym is not pretty or labeled with a big manufactures name on it, but it works incredibly. Now go to the gym and get on that rounded preacher bench and build the guns.